Ever wonder who was first? I do. The Colorado River Toad lives in our part of the world and is said to produce a chemical that belongs to the family of hallucinogenic tryptamines. These substances, present in the toad’s skin and venom, produce psychoactive effects when smoked or when one licks the back of the toad. So who first discovered that? Who found one of these guys trolling around after a rainstorm and decided to lick it’s back? I can’t imagine. Similarly, I can’t fathom who first discovered that granules produced on the pads of our opuntia cacti might produce a beneficial probiotic culture if set in water for a couple of days with dried fruit. These granules are sometimes referred to as tibicos. In our house, we refer to them as water kefir grains but they aren’t really grains at all. They are a culture of bacteria and yeasts held in a polysaccharide matrix created by the bacteria. We use them to make a fizzy probiotic drink by the same name – water kefir. Apparently it’s been around for centuries and it varies slightly all over the world. I was first introduced to kefir via the author of the Table of Promise. Christa and I connected in the blogosphere over school lunches but quickly developed a friendship based on motherhood and working and a desire to feed our families well. She offered me milk kefir which has become a part of our daily routine. A few months later, our milk kefir grains had grown abundantly and I shared them with many others. In return, my sister introduced me to water kefir grains. Many people claim health benefits from drinking it. While I can’t say that I’m aware of any personal health benefits, I do enjoy the refreshing carbonated beverage and slowly, my family is catching on too. 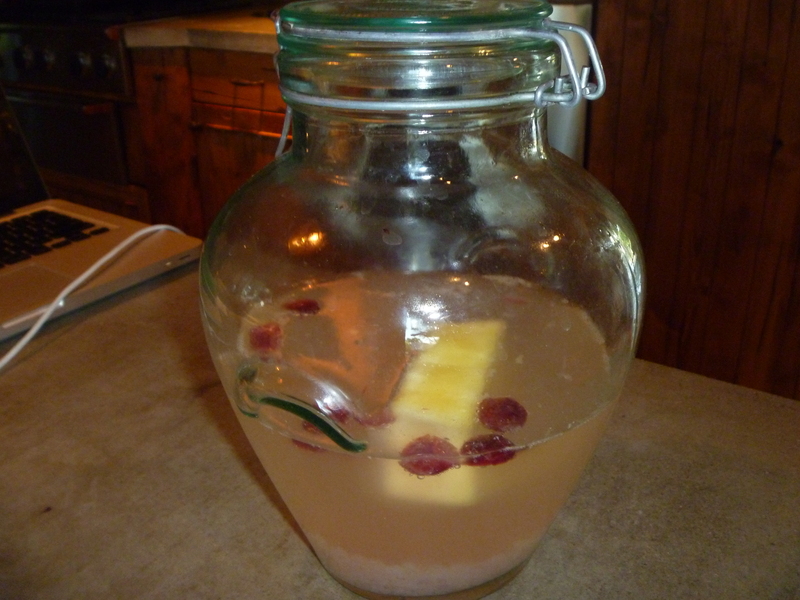 Water kefir takes from 48 to 72 hours to ferment. We make it a couple of times a week so that we always have a stash in the fridge. The kefir grains feed on sugar water. I place 1 quart of filtered water in a large glass jar with 1/4 cup of organic sugar. Once the sugar is dissolved, I add the water kefir grains and fruit. In the photo above, I’ve used 1/2 of a pineapple core with a few dried cranberries. Lemon and figs are a very popular combination. After 48 hours, the water kefir is ready to strain. It’s important to use a plastic strainer as the kefir can react to metals. Toss the fruit into your compost pile but make sure that you capture all the grains. Rinse the grains prior to putting them into another batch of sugar water. I find that these stopper bottles work best. Sometimes I add another small piece of dried fruit to the bottled kefir. I let this sit for an additional 48 hours for a second fermentation before placing it into the fridge. The result is something that will easily outpace the consumption of soda pop in your household. 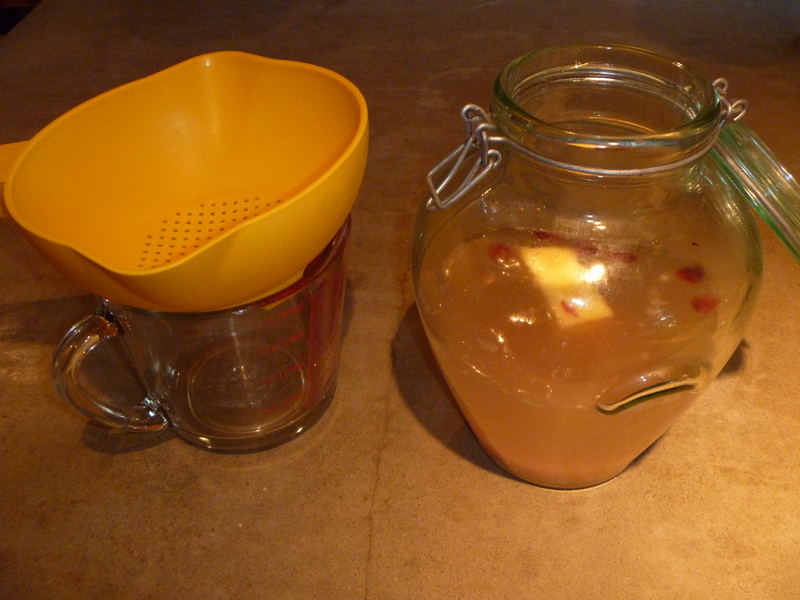 Water kefir is not sweet but has a fragrant taste and carbonation. It works to keep your intestinal flora healthy and some claim that it is best taken on an empty stomach. If you find that you are interested in water kefir, you’ll find many resources on the internet to get you started. Now, I’ll ask again, don’t you wonder who went first? Thanks for such an informative post! Personally I would not lick a frog! Seems really odd, doesn’t it? I haven’t come across the drink or the granules before, so thanks for an interesting read. You and I have much in common then! I had no idea! Wonderful that you have a hand in saving and passing down knowledge that probably passed generation to generation for hundreds of years. Thank you! Great point Cindy. I do wonder how old these things might be. Oh My Gosh Tammy I always learn the most interesting things from you! I have never heard of any of this…. have no idea if we have such things here in SA… however very well written interesting read. Thank-you! I’m certain you do have it but don’t know where. Now that you’ve heard of it, you’ll be more attuned. Sophie, from your recipes and blog it seems that you are moving more and more towards being vegan. I first learned about fermented drinks from raw foodists. I also make kombucha but think I’ll save that for another post some day. So, you already know that there is plenty of reason not to drink diet soda and yes, I think you’d find this a great substitute. It’s a habit that I had for years so I totally relate. You might also like one of those SodaStream carbonators that Tracy mentioned. Then you’re creating your own beverages and know what goes into them. Wow, you never cease to amaze me with your informative posts. Thanks for the info. Thanks Hippy Dude. I think this would work with that paleo thing of yours too! Yes, it is big. That was a couple of years ago and he wanted to keep it. Fortunately, we could talk about the toad missing it’s mommy! I’ve sometimes wondered who figured out the good things and the bad things out there…you are right at some point someone had to lick the frog to know. It’s fun to think about, isn’t it? Intriguing! Thankfully, soda for me is a rare indulgence. We have a Sodastream carbonator so “bubbly” water is a staple in our fridge (LOVE it with pomegranate juice!) It is also nice that we can mix up a Coke Zero every now and again and simply enjoy a glass instead of opening up a large bottle (tho, I do praise the soda companies for their recent offerings of the tinier soda cans which are perfect for one). You know, I got one of those for Christmas and you just made me realize that I my husband must’ve put it somewhere and I’ve forgotten all about it. Fascinating. Kefir has taken off around our community these days, although I haven’t quite got the hang of it yet (can make the first batch, but seem to go off track during the second fermentation). Anyway, I know a lot of people who will be very interested in water kefir. I’m a little unclear – do you need to use different kefir grains for water than for milk, etc? I have read that you can change milk kefir grains into water but they are VERY different looking and I wouldn’t try it for fear of losing the grains. 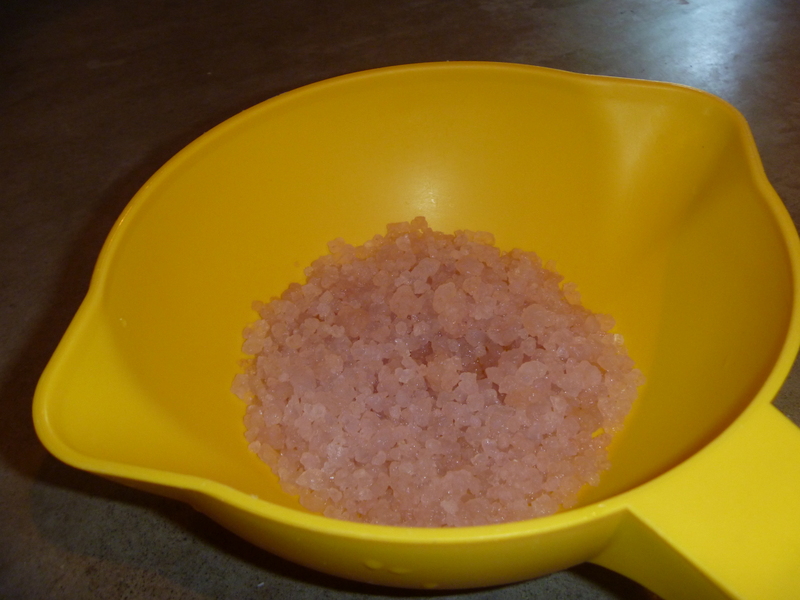 The water kefir grains that I got were dried and I rehydrated them and then began using them. Not every batch is perfect. I have found that they seem to be a lot better with the stopper bottles though. Very helpful, thanks – I’ve already posted this article on our “Eating Local” Facebook page, and will share this as well. Cool post! I’ve tried your water kefir, and I enjoyed it so much. We don’t drink soda in our house either, so it would be a wonderful alternative. Spritzers made from seltzer water and concentrated juice during the summer is a treat for us. As soon as these grains grow, I’ll give you some. They seem to grow more slowly than the milk kefir grains. That would be wonderful. Thank you! I always ask that question – speculation about taste pioneers is fascinating. But today you have introduced me to something completely new. I have never heard of water kefir! Thank you so much! It’s been really fun to experiment with. I need to start keeping a journal so that I know what flavors and fermentation times have worked best. You’ve got me wondering about water kefir now! I’ve been drinking milk kefir since my friend Ben shared grains with me a year and a half ago, and it’s gone a long way to healing my antibiotic-damaged gut. I’m starting to feel like all this dairy is not so good for me, however. Maybe I should give water kefir a try? Thanks for the inspiration and info! I was sort of in the same place – feeling like there was too much dairy in our diets and, with having to make milk kefir daily, it was hard to keep up with. Water kefir is more forgiving. Yes, I do wonder! One woman who is in our Master Gardener club always wants to know about things like wild and unusual edibles, not because she intends to eat them, but because she wants to know in case she was ever desperate enough to need them. I’ve been thinking about getting some water kefir grains, but hadn’t quite decided to order them. Your endorsement might just nudge me into finally doing so. Any suggestions for a good source? Lemon and ginger are really good. I’m going to start keeping track of what works and what doesn’t. You should. If your friend lives nearby, get grains from her! Fortunately I was too young to lick frogs, try strange mushrooms, etc in the 60s! My problem with anything cultured is keeping it up. But this sounds really interesting–especially with summer on the way. I have the same problem but have found that this one is the easiest for me and I also like it the most. I suspect that there was some kind of hallucinogen involved before the first toad was licked. I suspect you are quite right!! Do you have it where you live then? Oh Tam, I love my kefir grains that you passed on to me. Today on my birthday, I gave all who would dare, water kefir with mango, and it is the best. Like the best champagne without alcohol, and so healthy. I have enjoyed the different fruits, mango and ginger my favs. Thank you and it is flora and fauna favorable!! So glad that worked out for you! Happy Birthday! Thanks so much for sharing this information, Tammy. I have enjoyed milk Kefir, but now that I have eliminated dairy from my diet, this will be a nice alternative. It sounds tasty! That was the first reason that I began exploring this and that milk kefir is harder to keep up with. ohh, come on Nancy! Live a little. Tammy, this is a very cool and informative post. Never heard of water kefir. Wondering where one might buy the water kefir grains? (Or maybe I didn’t read this closely enough?) I could check at our co-op. It sounds like a refreshing possibility. I will talk to my sister because I think she lives near you and see where she gets them. Otherwise, go online. It is great tasting and good for you. Ewwww. 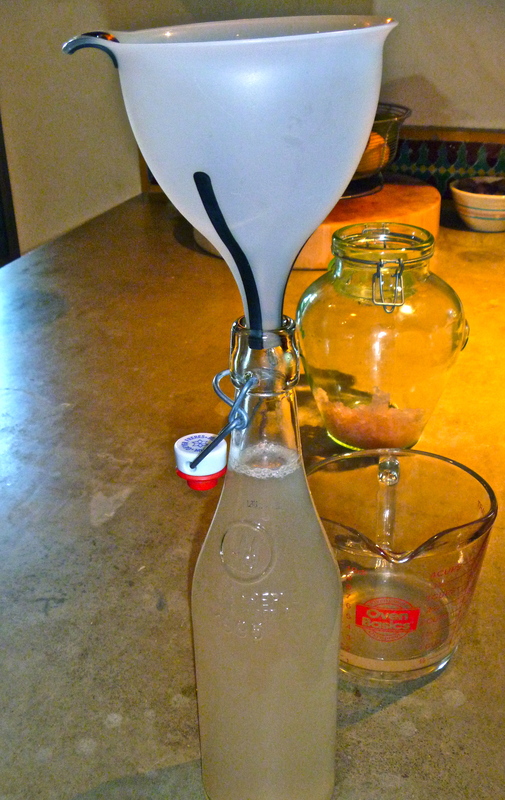 Wondering if you’ve tried water kefir? This sounds really cool. I’ve had dairy kefir and coconut milk kefir, but I’ve never heard of water kefir. I always learn something new from your posts. Thanks! It’s lighter and I really like it. Yep, I’m very fond of turtles! Fun! I know that the big slugs we have here in the northwest also have the hallucinagenic effect and I am glad I am not even tempted! The water kefir though is my new favorite even over kambutcha. Thank you Tammy. I find organic raisens and lemon wonderful in starting the batch and then when bottling it I like best mango and also pear! I also add a small slice of ginger to both kinds. I let it sit twenty four hours. It is magnificient. Much better then soda pop by far. Keep track of your favorites. It will be fun to compare notes. Great post! This reminds me of brewing beer (well, OK, many things do) because of the specialized yeast. Using different strains of yeast can make batches of beer taste remarkably different. I’d be curious to try your recipe with a variety of yeast strains that might highlight the flavors of the fruit ingredients. Because you’re brewing with washed but presumably not sterilized equipment (home autoclave anyone?) your flavors will also be helped out by the natural bacterias and yeasts that exist in the air of your kitchen. This is one of the things that makes many Belgian beers – and now your kefir – world famous! Interesting. I didn’t know that at all. That’s probably why kefir grains vary so much. Ha! I love love love that photograph. Who was first? I wonder that about so many things that we eat and drink—or avoid eating and drinking. Some adventurous–or foolhardy–or desperate–or inquisitive soul paved the way on more than we can imagine. I was drawn into this post by the adorable photo, but kept reading for the very interesting information. I’d never heard of water kefir. You do have to wonder who was the first to try something that might seem questionable, but hungry or thirsty people might not have had a choice. Our refrigerator once had a faulty thermostat. It varied wildly in temperature. After a couple of days, the skim milk formed a sort of yogurt-like substance. It smelled sweet. I tasted it. It was delicious! But I dumped it out, because I was unsure of whether I should drink it. Had I been desperately hungry, I would have drunk it. And if I lived, I would have tried to make more! I agree that it probably depends a lot on your condition. But still, the idea that these grains which apparently appeared on a cactus. Did they fall of into someone’s sugar water and this tradition was born? It’s just difficult for me to imagine. True. How do these strange combinations get started? And then tasted? Here’s a toast to those who tasted before us! Prickly pear fruit and pads are a staple foodstuff in Mexico and South America. They are also used to brew an alcoholic beverage. Prickly pears are native to the Americas, and did not go to the rest of the world until the Columbian exchange. I hope this clarifies for you the origins of tibicos: it was invented by Native Americans. Prickly pear has many culinary uses, including this one. I would like to try the beverage that you are referring to. Thanks Anne. That’s my baby! Thanks for the post, Tammy – I had never heard of water kefir before and will have to give it a try. I will bring you some to see how you like it. I cannot wait to try this drink it sounds amazing and so healthy. I am with you, I have a growing list of who was the first person to try this and why such as the puffer fish, and I wrote once about the Sicilian maggot cheese and again for the life of me, why, why, why? Laughing out loud LouAnn. I had forgotten about the Sicilian maggot cheese. This sounds very refreshing. I wonder what its called in India. Never heard of anything like this. I don’t know what you might call it in India. I’ll bet you can find it though. 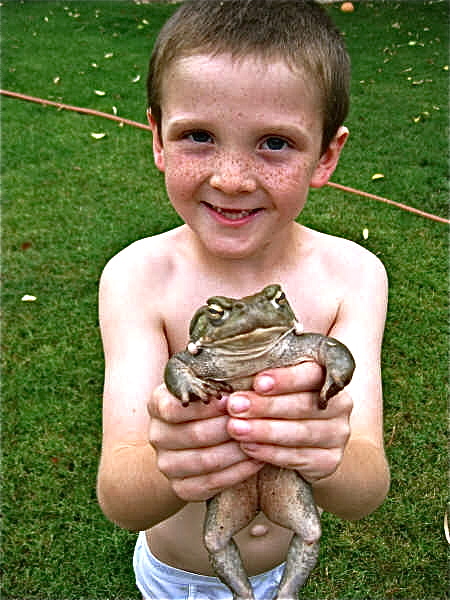 I think our dog was addicted to Colorado River Toads. Our dog, Chewbacca, came in from outside with cloudy eyes and foaming mouth. The first time we did not know what it was and $250 later the vet told us. He went after them a few more times, each time we just washed out his mouth with water, but I swear he enjoyed it, even though he acted really strange. I have a friend and this also happened to her dog! When she walked through the vet’s door, one look and they said, “he licked a toad”. I think that’s very bizarre. Let me know if you have trouble finding these. My brother in law travels to Penukonda fairly frequently (don’t know how far that is from you) but he has taken care packages to other friends of mine. I just gave up on milk kefir. It was too much work for me but I love the water kefir. Hi Tammy, nice to see your blog. I am from México and i start to drink Tibicos during three weeks and they are fantastic! I am in Miami beach now, so i would like to know where or who have Tibicos around.